Developed in England, royal icing was originally used for special occasion desserts such as weddings and baptisms. Today, royal icing remains a versatile decoration for cookies and cakes. It is made from powdered sugar, water and egg whites or meringue powder and dries smooth and hard. 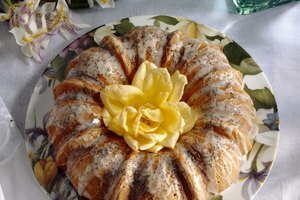 While it is not recommended for frosting an entire cake, royal icing may be used to create different types of icing decorations, such as flowers and animals, when piped through a pastry bag. Because royal icing is made from mostly sugar, decorations made from it may be kept indefinitely if properly stored. Air dry your royal icing decorations on a baking sheet lined with waxed paper for 24 hours or until completely dry. When dried, the decorations will be hard and have a matte finish. If you live in a humid climate, add an extra teaspoon of meringue powder in your icing recipe. 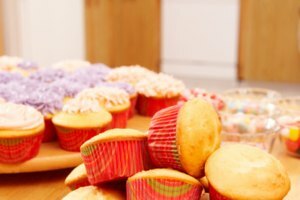 Place dried icing decorations in an airtight container, such as a glass jar or plastic storage box. This will ensure that the decorations last indefinitely, or until your next special event. Store decorations in a cool, dry and dark place, such as a cupboard or closet. This will help prevent fading of the icing's color and guard against damage caused by dampness and humidity. To use the decorations on a cake, frost the cake before adding the decorations. If you are using a frozen cake, defrost the cake for three to six hours before frosting and decorating it with the preserved icing decorations. To use the decorations on cookies, frost or pipe royal icing on cookies before adding the stored decorations. The frosting or royal icing acts like glue for the decorations on the cookies. To store royal icing being for frosting or freshly-piped decorations, secure the icing in a pastry bag with a twist tie and place in an airtight container in the refrigerator for up to two weeks. 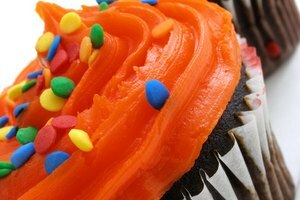 For bold or dark colors, use food color gels rather than liquid food coloring. Do not use any food product with mold or fungus growing on it. 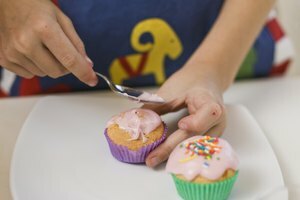 Can You Eat Cake Icing That Is Out of Date?